NJB Article and Source Repository: Neanderthals in Germany Went Extinct Right After Their Population Peak. Neanderthals in Germany Went Extinct Right After Their Population Peak. 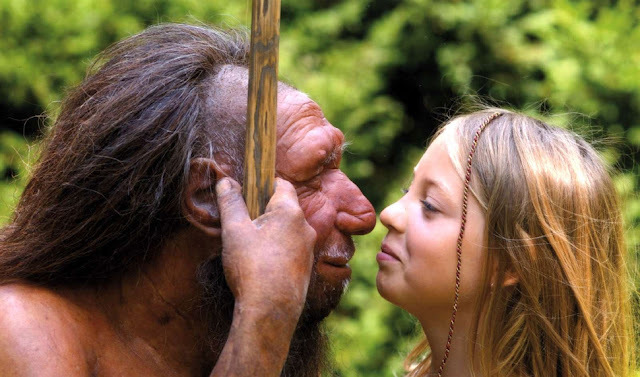 A reconstructed Neanderthal with a modern human girl. Neanderthals in Germany Went Extinct Right After Their Population Peak. By Ginger Perales. New Historian, July 25, 2016. Neanderthals in Germany: First population peak, then sudden extinction. ScienceDaily, July 21, 2016. Leave at the height of the party: A critical review of the Middle Paleolithic in Western Central Europe from itsbeginnings to its rapid decline. By Jürgen Richter. Quaternary International, available online, April 12, 2016. Approximately 45,000 years ago, Homo neanderthalensis was the dominant human species in Europe, populating the whole of the continent. Although archaeologists have discovered numerous settlements in Germany, they have also uncovered evidence which shows that Neanderthal populations there came to an unexplained, sudden end. Based on the analysis of several archaeological sites, Jürgen Richter (Collaborative Research Center 806 — Our Way to Europe), has concluded that shortly after Neanderthals reached their peak population in Germany, their numbers rapidly declined, leading to their extinction. Neanderthals lived during the Middle Paleolithic, the time between 200,000 and 40,000 years ago. Richter’s research suggests that over 50 percent of the identified Neanderthal settlements in Germany specifically date back to between 60,000 and 43,000 years ago. Therefore, the peak Neanderthal population lies within this period. Neanderthals were an ancient human species, part of the genus Homo, that became extinct approximately 40,000 years ago. With 99.5% of the same DNA, they’re closely related to modern humans. Bone and stone tools left by Neanderthals have been found throughout Eurasia, in western to central Europe, and northern and western Asia. Their species is generally classified as Homo neanderthalensis, believed to have separated from Homo sapiens around 600,000 years ago. Some experts however, believe Neanderthals were a subspecies of Homo sapiens and therefore should be classified as Homo sapiens neanderthalensis. The number of Neanderthal sites, as well as the analysis of artifacts discovered in them, indicate the Neanderthal population in Germany were subjected to extreme demographic changes. For example, during the Middle Paleolithic there seem to have been numerous migrations, increases and declines in population, even extinctions in certain locations followed by a return of settlers. During the time period between 110,000 and 70,000 years ago there were only four identified Neanderthal settlement sites in Germany, however, during the following period between 70,000 and 43,000 years ago there were ninety-four. Less than 1,000 years later, after this peak in population, there was a rapid decrease and the Neanderthals disappeared. Why the species went extinct is still unknown. It may have been the result of decreased genetic diversity; another possibility is competition for resources with the growing number of Homo sapiens. Around 55,000 years ago, the climate began to fluctuate back and forth from extremely cold to milder cold conditions in the span of a few decades. Neanderthals had bodies that were well suited for surviving in cold climates, with stocky limbs and barrel chests that stored body heat much better than Cro-Magnons (the first early modern humans). However, these rapid climate fluctuations also caused ecological changes that the Neanderthals could not easily adapt to; familiar animals and plants would have been replaced by completely new ones within the space of a lifetime, and the Neanderthals’ ambush hunting technique wouldn’t have worked as trees replaced the grasslands. Neanderthals eventually went extinct in Europe between 41,000 and 39,000 years ago, coinciding with a period of extreme cold.